For Therapeutic Results Your Essential Oil MUST Be Pure. Find Out 4 Ways to Know if an Essential Oil Purity. Plus a Simple Test You Can Do to Assess Purity. Most of us who love aromatherapy and use essential oils as a part of a healthy lifestyle choice know about the importance of purity of our essential oils. FIRST - Knowing and trusting your source. SECOND - Testing the oil with Gas Chromatography/Mass Spectrometry (GC/MS). The GC/MS analysis report is the Gold Standard for purity of essential oils. Every batch of oil that a retailer of pure essential oil purchases directly from a distiller must be tested with GC/MS to ensure purity. Gas Chromatography (GC) is a method of separating the volatile compounds in essential oils into individual components and produces a linear graph that charts these components. Mass Spectrometry (MS) identifies each of these components and their percentages. This process is used to identify any adulteration, pesticides, or chemical fertilizers of the essential oil tested. Adulterated oils or perfume oils will not stimulate therapeutic effects and may in fact cause allergies, headaches and chemical sensitivities. Different MS tests are run to thoroughly analyze an oil to assure its purity. It is crucial that the GC/MS analysis report be analyzed carefully and scrutinized by a qualified and experienced aroma chemist to know the exact chemical profile of an essential oil, as well as discern possible adulteration. The precise breakdown of the chemical components in individual oils given by GC/MS reports are important as the therapeutic benefits and safety issues of essential oils are, in large part, determined by their chemical makeup. THIRD - Your own personal knowledge and experience of an essential oil is a third way that can and should be relied upon when purchasing from a retailer or wholesaler. 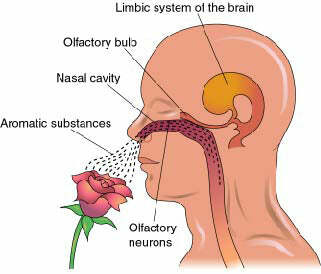 Collecting aroma samples of pure essential oils as benchmarks for selecting and purchasing your oils is strongly advised. FOURTH - A little known method of testing for an essential oil's purity that is quite reliable and one that anyone can easily do is the Blotter Test. The Blotter Test is an easy and simple way to test an essential oil's purity. To perform a blotter test I recommend using a perfume test strip, but a white sheet of paper will also work. Simply dispense a drop of your pure essential oil on your perfume strip, or a clean white sheet of paper. A pure essential oil will dry without leaving a telltale "oily" stain. However essential oil that has been adulterated or extended with synthetic fragrance oil will not dry clean and will leave an oily residue after drying. Some pure essential have a longer dry out period, so allow up to 24 hours, or sometimes several days or longer with thick resinous oils like Vetiver and Sandalwood. Re-test if there is any doubt about purity. The Blotter Test is a fairly accurate test for essential oil purity. However, if an expensive pure essential oil like Rose or Neroli has been extended with a less expensive pure essential oil (not a synthetic perfume oil) you won't be able to detect by an oily residue stain. This is where your experience and development as an aroma connoisseur comes in as adulteration of expensive oils are aromatically usually quite discernible. Good for your doctor to alert you as to the safety of ingesting oils. Essential oils are approved by the FDA as food flavors and may be used safely as food flavors. Essential oils are very concentrated (1 drop equals 3-4 cups of plant matter). FYI: You receive a FREE aromatherapy course (limited time offer) with your PurePlant Essentials order that covers using essential oils as food flavors. Hope this is helpful! Wishing you all the best, Donna.